Happy Winter! December 21st or December 22nd of each year marks the first day of winter. For the past year or so, my family has been celebrating the rhythm of the seasons marked by the solstices and equinoxes. We find this to be a good way to learn about, reflect, prepare, and celebrate the season ahead. The Winter Solstice is the shortest day and longest night of the year. After this day, the days will get longer and longer until the Summer Solstice, the first day of Summer. In the northern hemisphere, the Winter Solstice occurs when the earth’s tilt is furthest from the sun thus the cold days and long, creeping shadows. Many holidays and festivals during the winter season have roots in observance of this astronomical phenomenon, the rebirth of light. In a world where the lights are always on, gadgets and technology leaving faces aglow with constant media all hours of the day and night, the Winter Solstice is an opportunity to pause and give tribute to the natural rhythms of life. 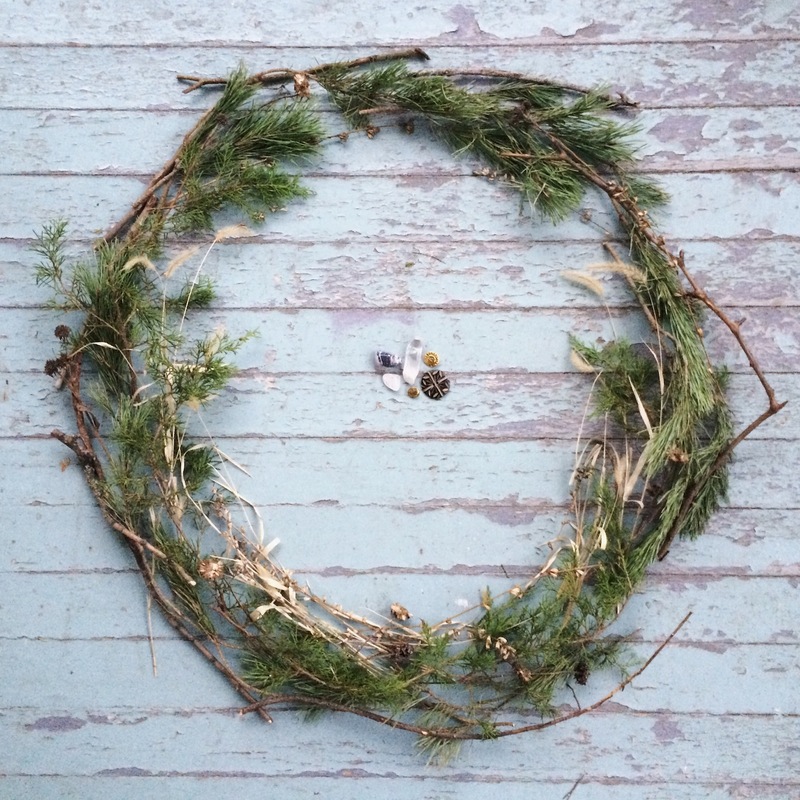 Each solstice and equinox we have a little tradition of the fairies of that season making a fairy ring marking their arrival and thus the arrival of the new season. 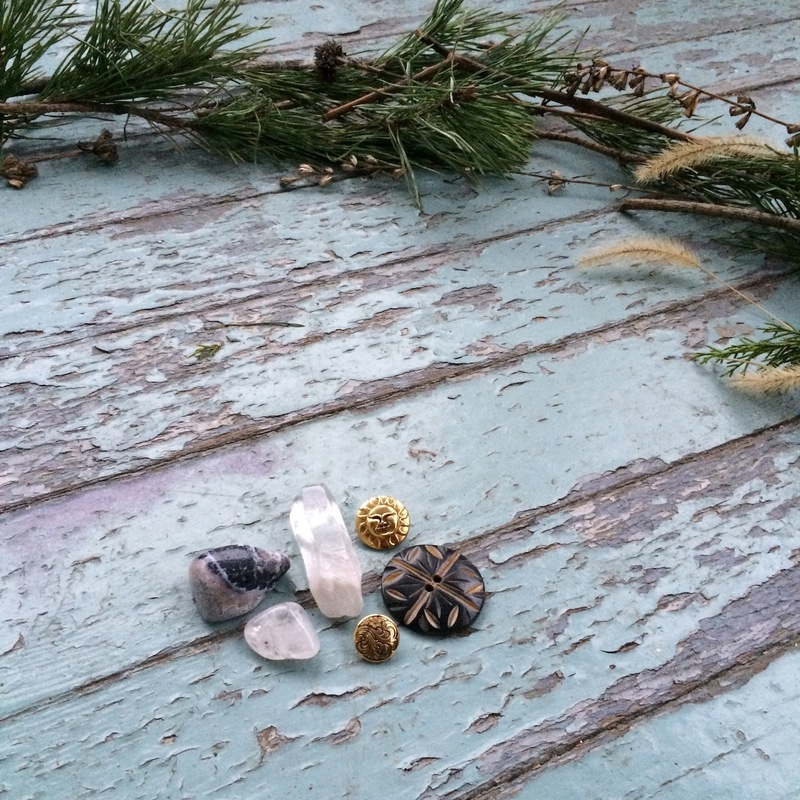 Typically, I make a ring before the girls wake up in the morning of foraged nature items found from hikes. In the center of the ring are a few tokens such as stones or buttons or bells. Throughout the year, the girls make fairy houses in our yard, and this is a way for the fairies to thank them for a place to say for the season. In the morning, they rush outside to see the ring made by the fairies of the new season. During the Winter Solstice day, we turn off all electrical lights for the day and use candlelight whenever we need light. To me, this is by far the most enjoyable and fulfilling Winter Solstice tradition. In the morning, I light candles in a few rooms and as everyone wakes, in the soft glow we go about our morning until the sun comes up. 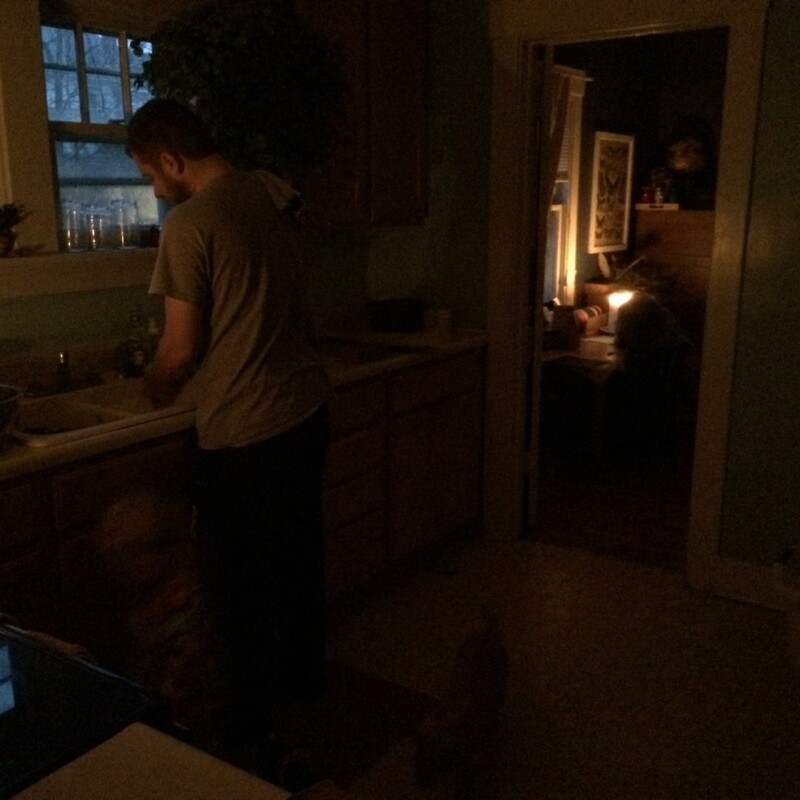 As the sun sets, we light the candles again and have dinner by candlelight. 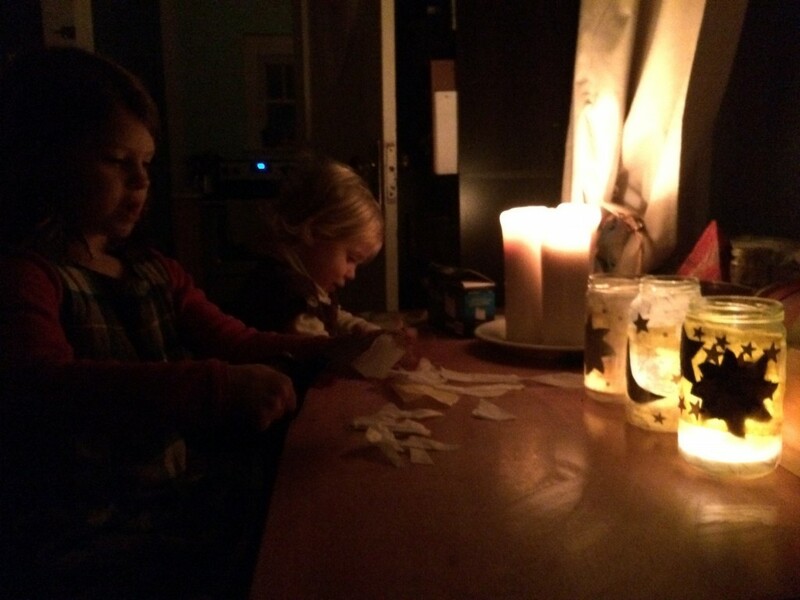 Even if you decide to only commit to eating dinner by candlelight, it is such an enjoyable experience for both kids and adults. 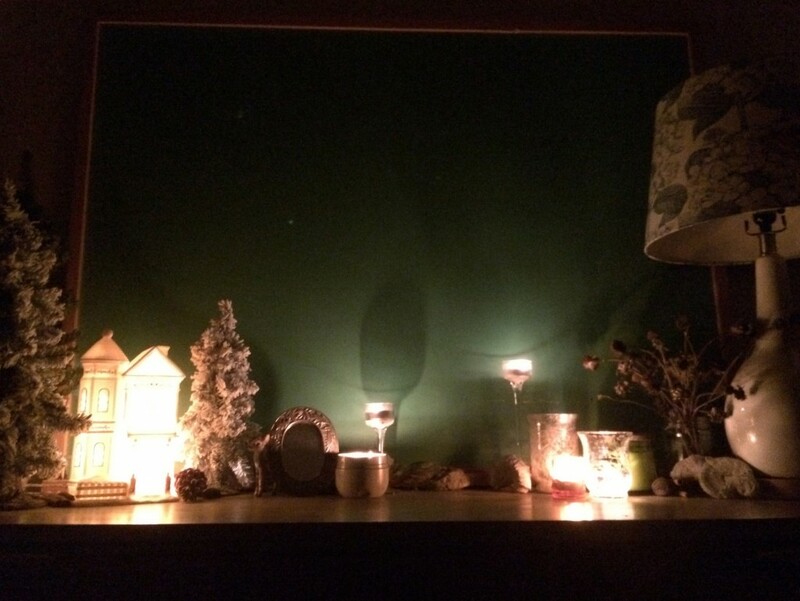 Candlelight by default sets up an intimate, soft mood. Another idea is to give a golden gift to loved ones– An orange, a golden wrapped candy, a small beeswax candle, a golden coin. 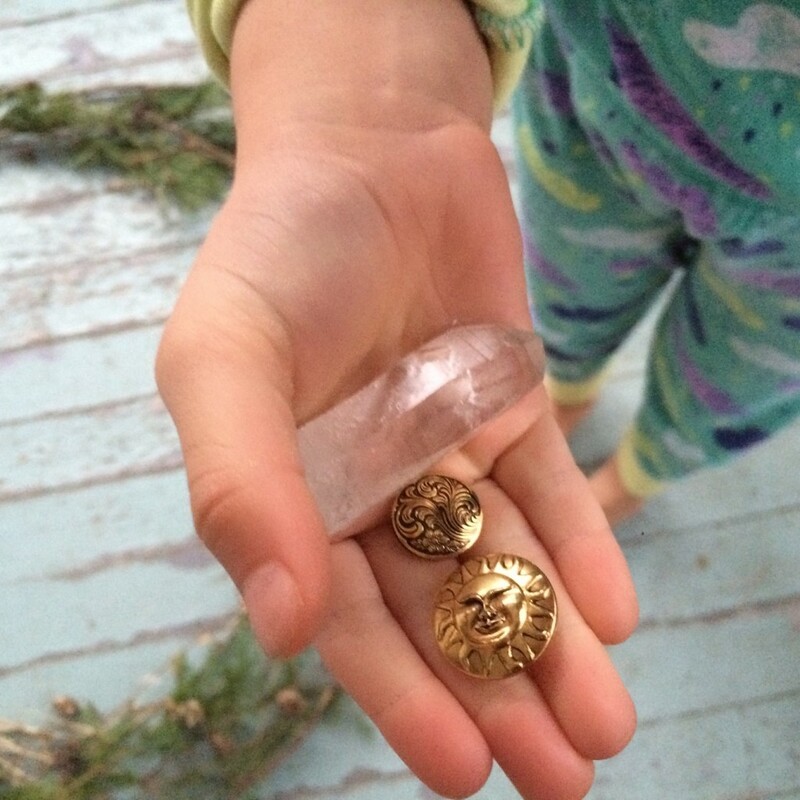 I try to keep it simple and give one little token to each child that represents the sun or sunlight. 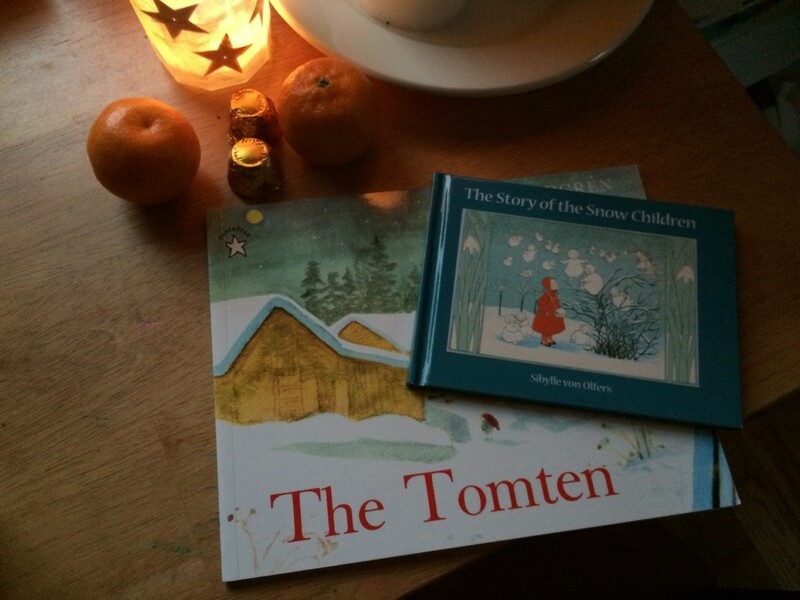 Taking time to read wintertime stories, especially about the Winter Solstice is a calm, interactive activity as well as a good excuse to cuddle up on the couch together. Here is a winter themed list of children’s books, including books about Winter Solstice. 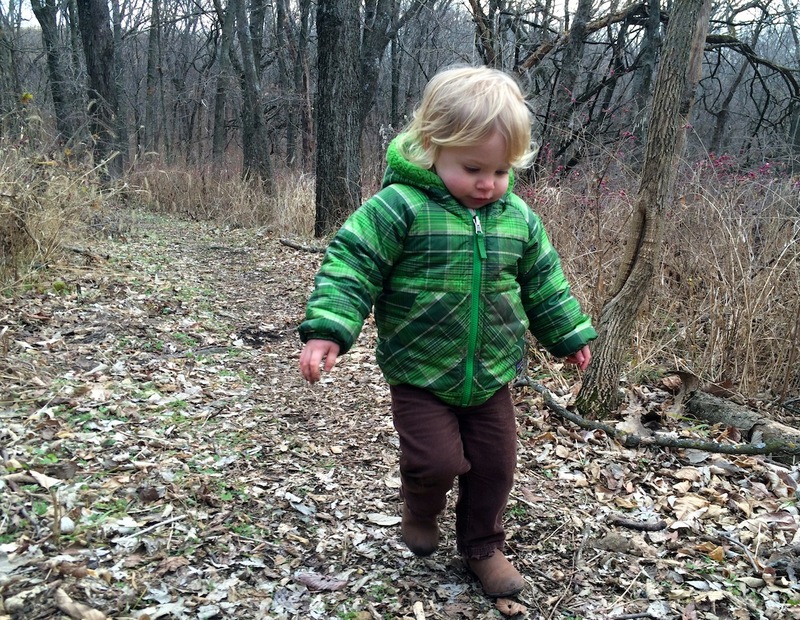 What better way to experience the nature of the season than take a walk outside? 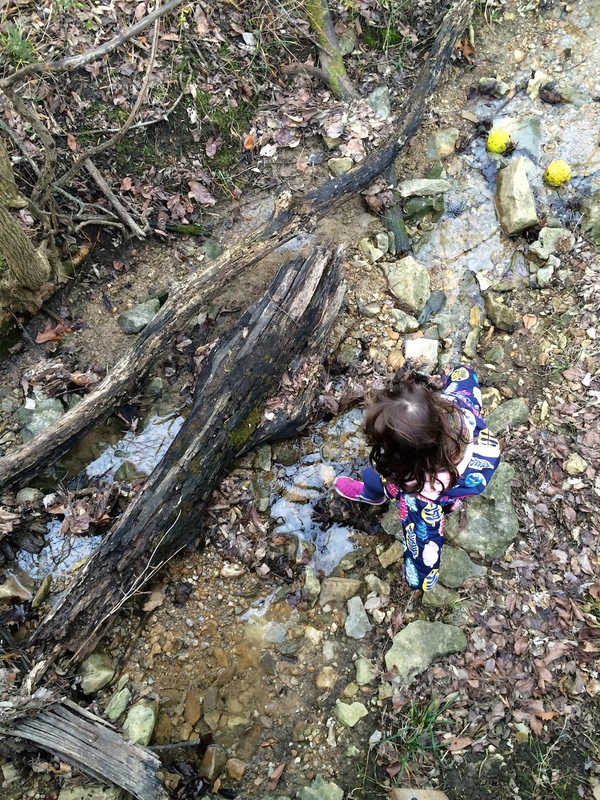 This year, we took to the woods. The day was cloudy and the tall trees protected us from the whipping Kansas wind. Without the wind, it was warm enough to discard hats and mittens. 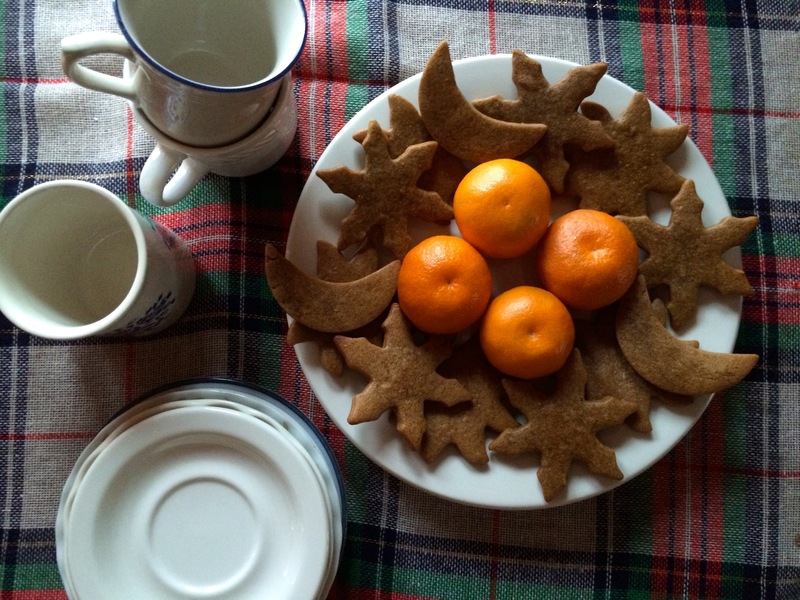 We had a few friends over for a Winter Solstice Tea Party serving gingerbread cookies, clementine oranges, and winter lemonade. They brought a treat as well and after we were done enjoying sips of winter lemonade and treats, we made Winter Solstice Lanterns. 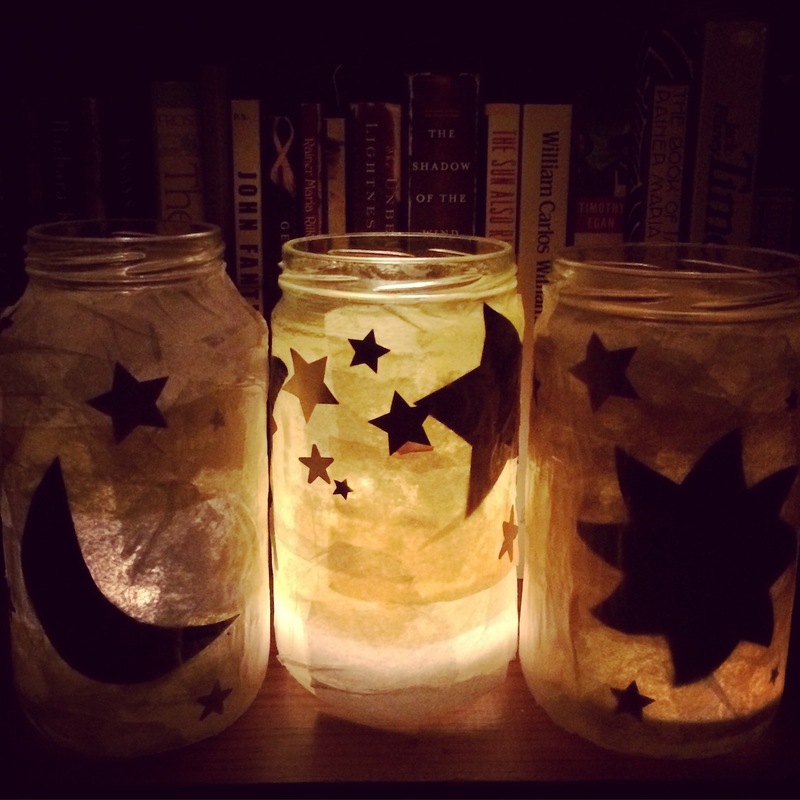 This year, we made Winter Solstice lanterns that looked beautiful when lit! 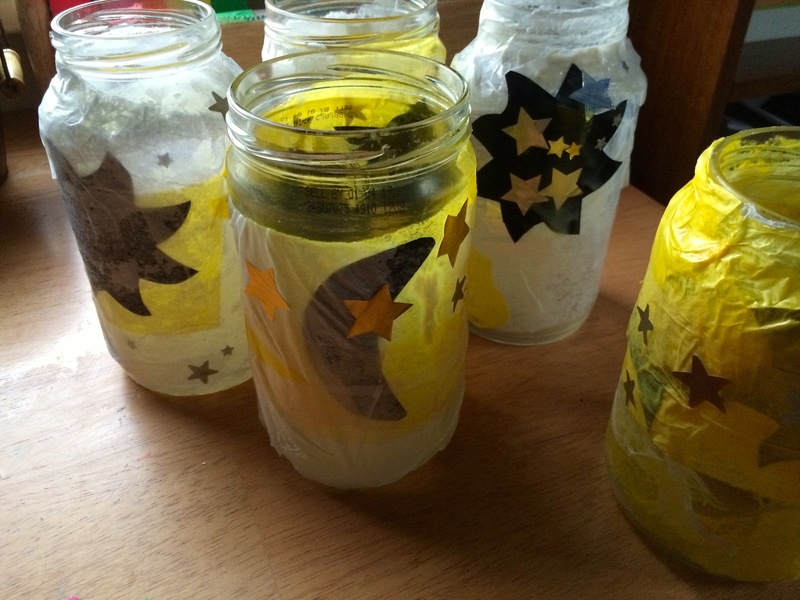 Inspired by this idea, we took pieces of white and yellow tissue paper and adhered them to a recycled glass jars using modpodge (or white school glue also works) and paint brushes. I cut out sun, moon, and star shapes out of black construction paper and those were also glued on with the tissue paper along with little star stickers we had on hand. 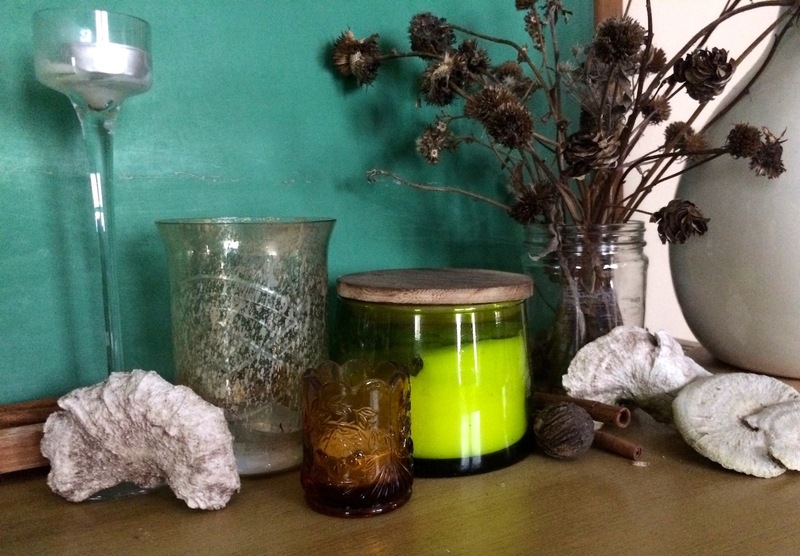 This next part is important– Only decorate the outside of the jar! Otherwise, you could have an unwanted fire or burning on your hands. 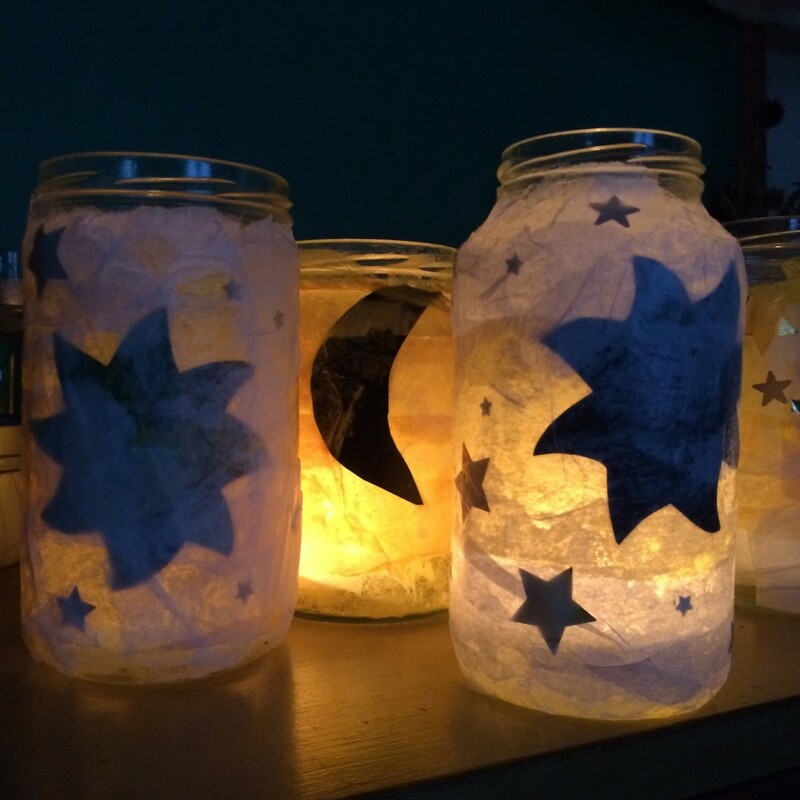 Once the design is finished to you or your child’s liking, apply one last thin coat of modpodge on the outside of the lantern, and let dry. It took an hour for these lanterns to dry and by nighttime they put on quite a glow show. 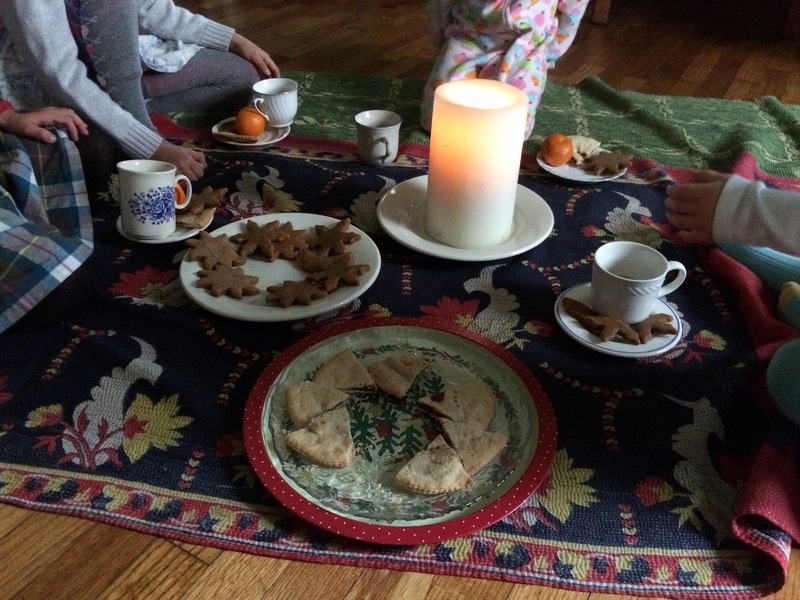 The concept of setting up a seasonal table is popular among Waldorf educators. 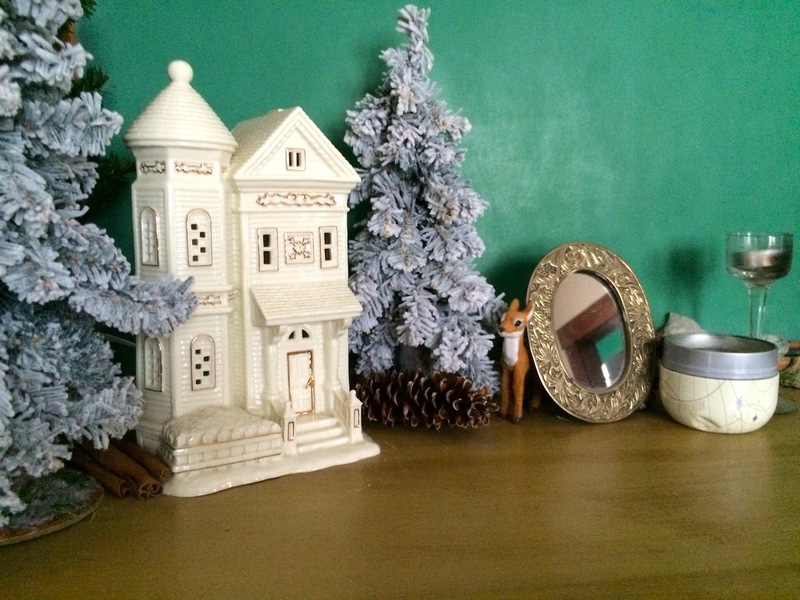 The idea is to set up a table or corner in your home or school with items from outside along with figurines and decorations to depict the season. A nature table is a delightful play provocation as well as a way to show appreciation and acknowledge the nature of the changing seasons. Except for the cinnamon sticks and anise stars, the items for our table mostly came from walks outside and thrift stores over the years that were decorating the house already. 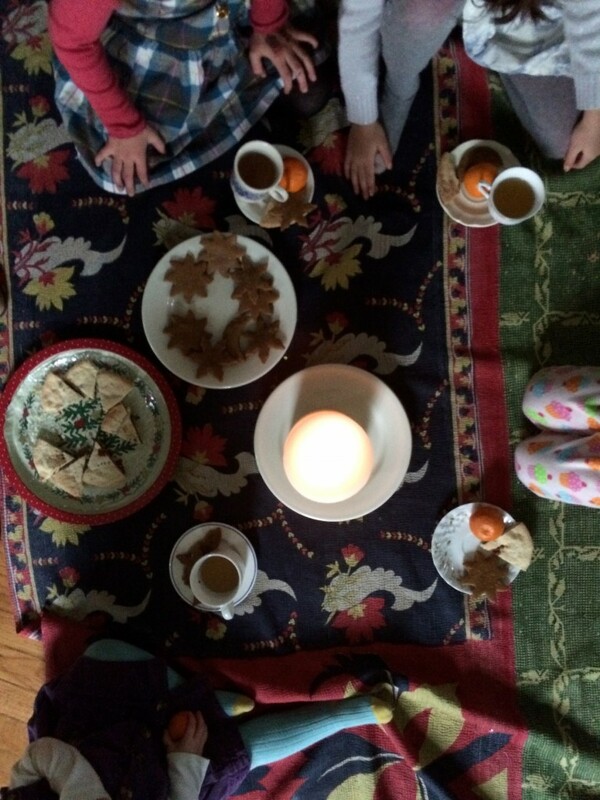 This was our first year setting up a winter nature table, but next year I plan on spending more time on this new tradition. We set up ours just in time for the Winter Solstice, but will continue to add to it or change it as the season progresses. My oldest especially enjoys this newfound practice and I think both girls, as they age, will continue to enjoy it as time goes on. 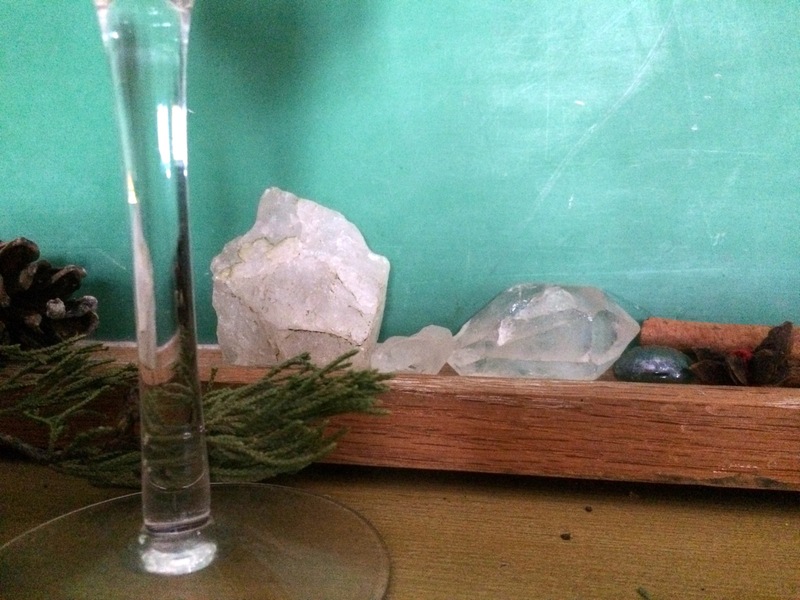 Here are a few tips for creating a Waldorf Nature Table as well as a collection of nature table inspiration. When the sun goes down and the longest night of the year has arrived we read stories aloud. 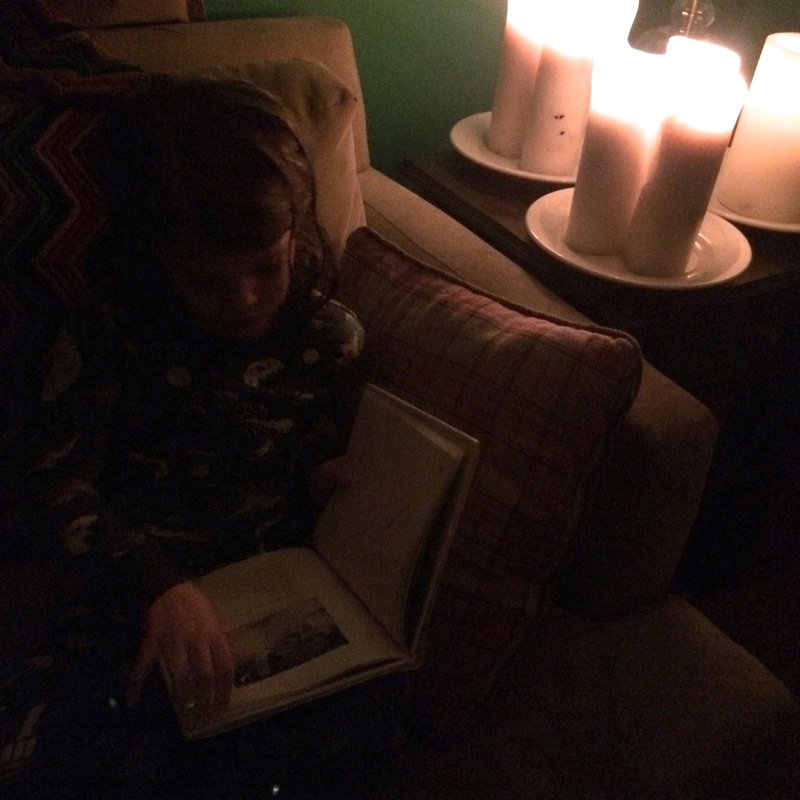 Bedtime stories are a part of our regular nighttime routine, but there is something very special about bedtime stories on the Winter Solstice. 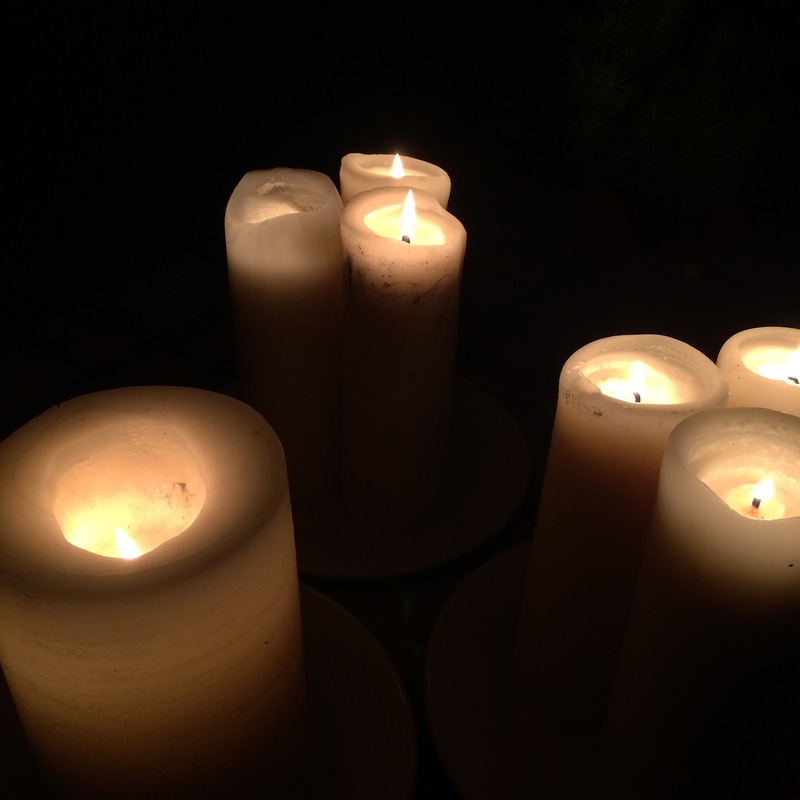 Maybe it has to do with the candlelight or the fact that it is dark so early? Or that our day was balanced between a mix of solitude and quiet, and celebration and togetherness? Since reading by candlelight is archaic, perhaps there’s an innate comfort of reverting back to old times, of a way of life long before modern conveniences? 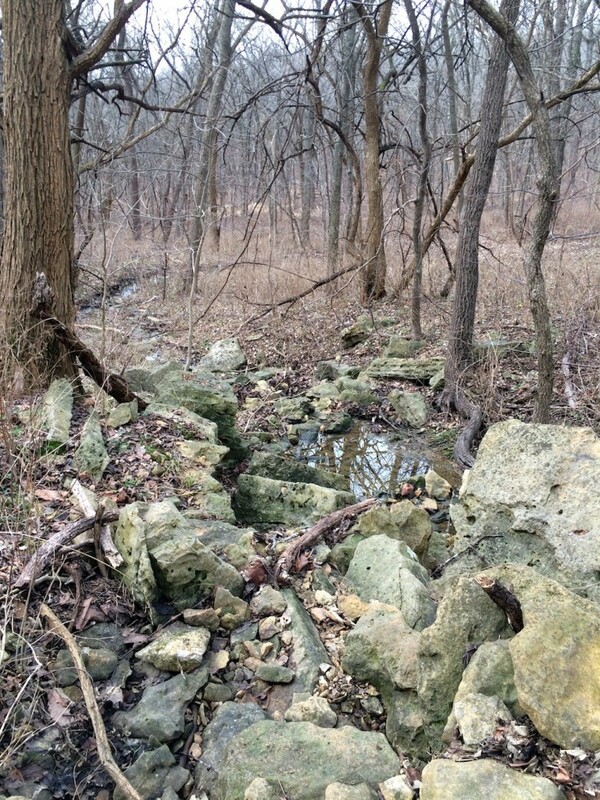 A magical time-travel experience? Stories have the power to connect us to histories and pasts long before ours and to enjoy these mythologies in flickering candlelight, like those before us is all the more transporting. What lovely traditions, thank you for sharing them. I have always loved the winter solstice. It is a nice way to step back from all the chaos of Christmas that just swirls about.